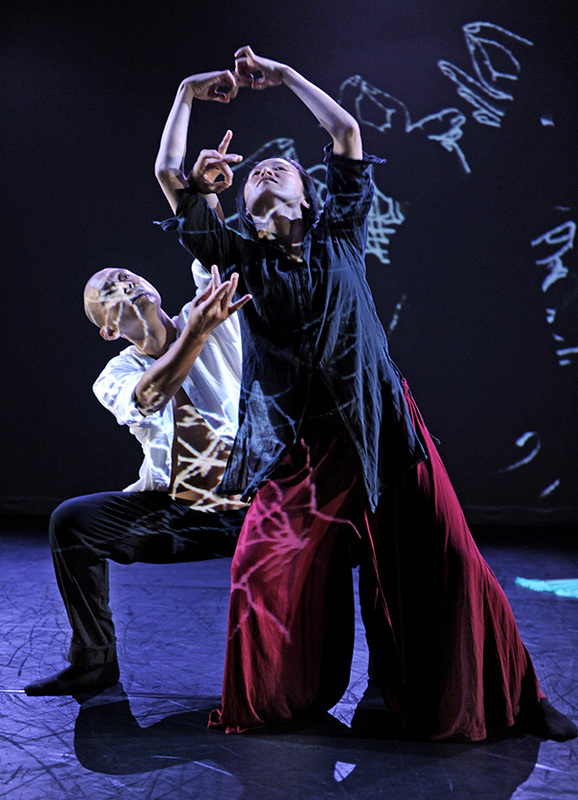 Made in China, produced by Wen Wei Dance and presented at the Firehall Arts Centre, is an interdisciplinary, contemporary dance performance about four artists born and raised in China and what it means to present themselves as such to a Canadian audience. It asks the question, “What are these artists trying to say about themselves to a western audience?” As the dance unfolds it becomes apparent that, for them, being Chinese is a combination of their traditional Chinese history that has marked who they are and how they work with their experiences with the same twenty-first century struggles and issues as western urbanites. The performance was undeniably about the performers. They entered the stage while telling personal stories about life in China and their first experiences with their art. Popular contemporary dancer and choreographer, Wen Wei Wang, invited the artists to collaborate with him: Sammy Chien, an interdisciplinary media artist born in Teipei, Qiu Xia He, a musician, composer and teacher of traditional Chinese instruments and Gao Yanjinzi, a contemporary dancer and director of the Beijing Modern Dance Company. All were raised in China and all but Ms. Gao now call Vancouver home. Everything they did exposed the roots of their classical Chinese training and upbringing, in the small stepped and swaying movements of Ms. Gao’s walk as her fan cuts through the air or Mr. Wang’s fluid Tai Chi informed explorations of his body in space holding a pair of chopsticks: the dancers presented identifiably Chinese portraits of themselves. Ms. Qiu sang Chinese melodies on traditional instruments and Mr. Chien bathed the spectacle in imagery projected on a background screen. The projection captured the dancers’ shadows and traced their movements across the backdrop like a calligrapher’s brush until the shadows crystalized around the dancer’s bodies only to explode in a multitude of free flowing animated particles. Everything the artists did expressed their Chinese sensibility and classical training, but they pushed the limits of their Chinese aesthetic in surprising and contemporary ways. They held their fans in their teeth, which covered their faces in an arc of fabric making the dancers’ quirky movements resemble a Guillermo del Toro creature from Pan’s Labyrinth. In other sections the precision needed by the dancers to execute traditional dance elements became inflamed by frenzied full-bodied movements, either fluid or jarring, hinting at the struggle to escape the past and come to terms with the possibilities of their newly won freedom. Though the dancers shared the stage, their preoccupation with their own movements isolated them from each other, turning them inward in their own internal world of physical investigation. At times they became like strangers in the same space. Mr. Chien’s visuals flashed through stills of communist China against static and strobe image effects. The cutting edge technology of his real-time performance software reacted to the performers movements by progressively thrashing them with technology as his projections transformed the initial intimacy of the space into a harried, digitized, urban landscape. Washing the visuals like an aural bath, Ms. Qiu’s voice and playing ran through a filter that added echo and reverb to create an otherworldly atmosphere. Their Chinese ancestry always remained but their contemporary explorations placed the performers in a physical and psychological state of isolation and unease. 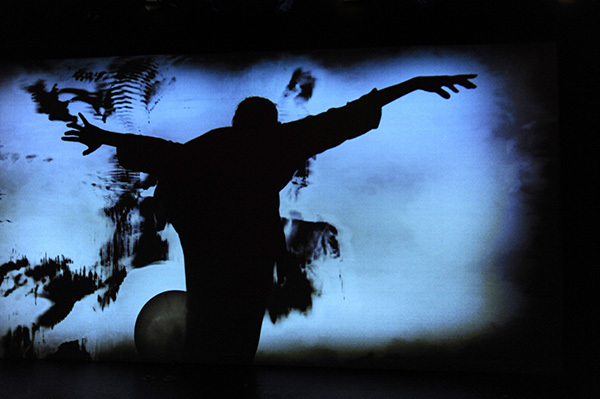 Made in China was conceived and created for presentation to a Canadian audience, therefore it reveals how the artists would like to be seen by Canadians. The title connotes the importation of goods and it states where they are from but it also recognizes they are somewhere new. Ms. Gao’s bio tells how her choreography for the Beijing Modern Dance Company uses her Buddhist upbringing and traditional Chinese dance training. But it is by combining these elements with western modern dance techniques that cause her Chinese audiences to “question the legitimacy of such binaries as ‘traditional/modern’ and ‘East/West’.” This quote reveals how her Chinese audiences see through a traditionally Chinese lens and are challenged by its fusion with western contemporary dance. In Canada, we relate to Made in China through the lens of contemporary dance and are challenged by the exoticism of the Chinese elements. Perhaps, looking at other Chinese artists presenting their work to western audiences can help reveal what they are trying to portray of themselves to Canadians. 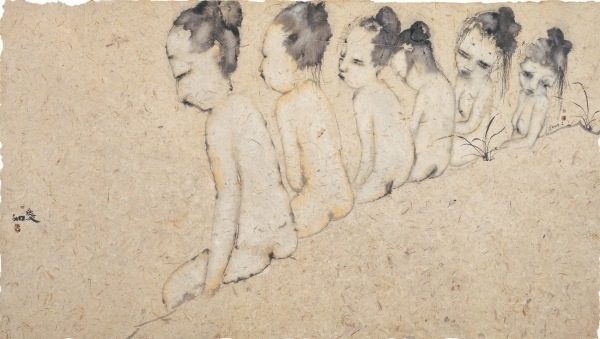 Two Chinese nationals, painters Su Xinping and Liu Quinghe, exhibited their work in the US. 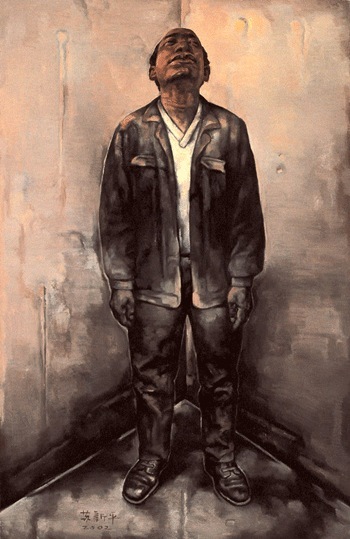 Both painters are of the same 1960’s born generation as most of the cast of Made in China and represent a new generation of de-politicized Chinese artists whose themes include investigations of modern isolation and alienation. Mr. Liu paints urban characters that share a detachment and an inner disquiet, “They’re tired. They feel stressed out (Wildman).” Where previous generations of Chinese artists had to conform to Mao’s doctrine of loyalty to the party Su states, “I’m loyal to what I’m feeling about real life.” Their characterizations of Chinese urbanites struggling with the alienating interpersonal effects of technological and economic advancement reflect closely the urban issues of their western counterparts (Mufson). For myself, as a Canadian viewer, the performance was exotic and familiar. Where the Chinese elements were otherworldly, the way the artists contemporized their work resembled the investigation of people and place in western performances. Their themes were situated in China but spoke to me of my urban experience in Canada. To me, what the artists are saying is, “We are Chinese, culturally and historically different from you, but living the same contemporary, global experience as you. We share the same hopes and challenges and are very much the same.” For the three artists living in Vancouver, and for all of us sharing the city with our neighbours from all over the globe, Made in China is a rich, provocative and thrilling reminder of how alike we really are.